Gantt charts and network diagrams are used to display visually the complexities and dependencies of project work. Network diagrams display the project work as linkages through the chronological flow of work from start to finish. Gantt charts visually display primarily the work breakdown and the associated durations. Both charts graphically show work breakdowns, enabling managers and workers to easily identify conflicts, co-dependencies and determine the effect of change in the system. Gantt charts use horizontal bars across a linear representation of time to show the duration of tasks graphically, whereas network diagrams use basic flow-charting tools to represent graphically the tasks through a workflow. Gantt Chats use rows of tasks with bars stretching across a time period to allow managers to review dependencies by identifying the rows of data required to be completed before tasks can begin. Classic Gantt charts do not graphically show the dependencies of work in the time-barred section of the chart. Many software programs supporting Gantt chart creation now map the dependencies visually as an added functionality. Network diagrams do not require additional steps to map dependencies. Visual representations, in flow-chart format, directly identify the dependencies with arrowed indicators. Gant charts identify tasks linearly to show the duration of work or total duration of the project. 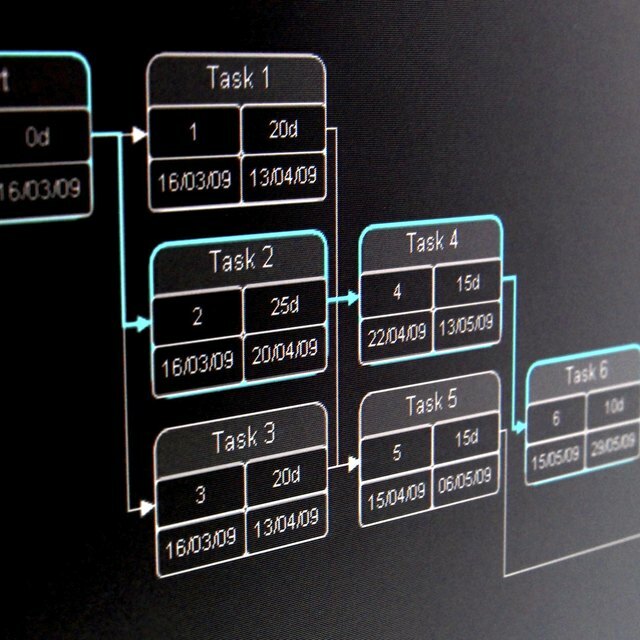 Network diagrams require calculating the total time for each task to derive the duration of work or project. Network diagrams are commonly built prior to Gantt chart creation to enable tracking of flows between work processes. Dependencies are more visible with a network diagram's arrow construction. Network diagrams offer greater visibility into logical relationships when constructed as connected workflows.